Manure is an inevitable byproduct of livestock and poultry production. Manure is a valuable material that can be used as a source of organic matter and fertilizer for crop and pasture production. Manure can also be used as source of energy on the farm through anaerobic digestion to produce biomethane or thermochemical process (such as pyrolysis, gasification, or combustion) to produce heat or electricity. Some of the by-products of energy production can be further processed to produce value added chemicals. and animal productivity as well as other factors. The chemical characteristics of manure primarily depend upon the chemical composition of the feed given to the animal. The animal metabolizes the feed to provide itself with energy and produce new body tissues and products. The waste products of metabolism are largely collected in urine and passed out with the feces (which may contain unused feed). Nutrient requirements by animals vary with animal type and stage of production. Usually, when the animal’s protein requirements decrease, the concentration of protein in the diet can also be decreased, thereby decreasing the concentrations of nitrogen excreted as a percent of body weight. Similarly, increased levels of minerals fed (e.g. copper, phosphorus, sodium, potassium) increase the level of those nutrients in the manure. It is recommended that manure analysis be done regularly especially if diet formulation and major changes in management of the livestock occurs. recoverable manure nutrients (the quantity of manure nutrients available for land application or utilization for other purposes). The nutrient content of manure is influenced by feed intake (which influences the nutrients excreted), manure storage and management choices (which influences the recovery of nutrients), and water additions/evaporation (which influences the concentration of nutrients). There are tabulated values that can be used to estimate the amount of manure an animal produces. The American Society of Agricultural and Biological Engineers (ASABE) has prepared a standard (D384.2) that lists the average quantities of manure and their characteristics. Excreted values are provided in Table 1 and Table 2. These average estimates of manure excreted become obsolete due to changes in animal genetics, feeding program strategies, and available feeds. Table 1 and 2 are representative of typical characteristics in 2002. Although sampling and the use of tabulated estimates are the most common methods of estimating manure nutrients, ASABE D384.2 provide equations for predicting nutrient excretion (primarily nitrogen and phosphorus), dry matter, and (depending upon species) other potential characteristics have been assembled for beef, dairy, swine, horses, and poultry. Software (listed at the bottom of this page) can simplify the use of these equations. When you want to develop a comprehensive nutrient management plans specific to your animal feeding operation (AFO). When you have farm-specific data for your feeding program and animal performance. When feed intake, feed nutrient concentration, feed digestibility, or animal performance varies from the assumptions used to estimate the typical values in Table 1 and Table 2. When industry trends have changed from the assumptions used in Table 1. When planning estimates are being made on a scale larger than a single farm (e.g. county or regional estimate of nutrient excretion). When a rough approximation is needed for farm planning. When farm-specific information of animal performance and feed intake is not available. Caution: When using the typical as-excreted manure production and characteristics presented in Table 1 and Table 2, the user should recognize that the reported typical values may become obsolete with time due to changes in animal genetics, feeding programs, alternative feeding technologies, and available feeds. In addition, users should also recognize that under current conditions, excretion of nutrients and other related characteristics will vary for individual situations from the currently listed values due to variations in animal feed nutrient intake, animal performance, and individual farm management. Bedding is sometimes included in the manure. To estimate the amount of bedding used, weigh the bedding added to each pen per week and multiply the number of pens and the weeks between cleaning. Estimate the total weight of bedding and manure by adding the amount of manure produced using Table 1 or Table 2 or calculated using equations to the amount of bedding; subtract any liquid drained off i.r. not absorbed by the bedding (neglect drainage if well bedded). To estimate the volume of the manure and bedding, add manure production volume to 50% of the bedding volume. The volume of the bedding is usually reduced by half during use. Many physical, chemical, and biological processes can alter manure characteristics from its original as-excreted form. The as-removed manure production characteristics values are reported in Table 3. These values represent typical values based on available data sources. These estimates may be helpful but have very high variability. The values may be helpful for an individual farm’s long-term planning prior to any samples being available and for planning estimates addressing regional issues. Whenever possible, site-specific samples or other more localized estimates should be used instead of the national tabular estimates. Permitted Concentrated Animal Feeding Operations (CAFOs) are required to annually report recovered manure for their individual farm. Use the tabulated values for planning purposes until site-specific values are available. 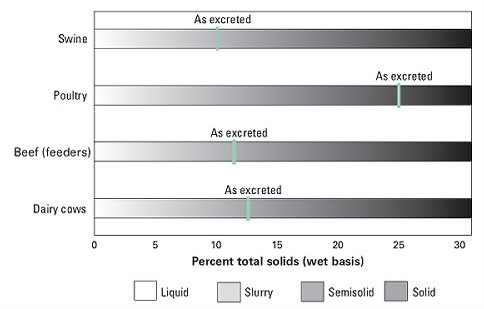 The handling characteristics of manure vary depending primarily on the solids content (Figure 20-1). Manure is usually classified as liquid, slurry, semi-solid, or solid depending on the total solids content of the manure. The boundary between handling classifications is not fixed but varies with specific composition. Manure can be classified according to the dry matter content as liquid, slurry, semi-solid and solid. Liquid manure contains up to 4% solids content and can be handled with irrigation equipment. Liquid manure with this kind of solids content can be obtained by removing larger solids from the manure through some form of solids separation, or adding dilution water. Lagoon treatment systems usually have less than 1% solids if designed and operated properly. Overloaded lagoons can reach up to 2% solids. Slurry manure contains 4% to 10% solids and may require special pumps for handling. *Semi-solid manure contains between 10 and 20% solids. The manure is too thick to pump. Solid manure contains 20% solids content or more. This manure can be stacked or be picked up with a fork or bucket loader. costs and value for land application. This is a spreadsheet-based program. ASABE. 2005. Manure production and characteristics. ASABE Standard D384.2. American Society of Agricultural and Biological Engineers. St. Joseph, MI.